Camp 18 is located on a body of exposed rock called the Cleaver, and it is bordered by the Vaughan Lewis and the Little Vaughan Lewis icefalls. Although it currently stands proud of these icefalls, it is clear from geomorphological evidence that the Cleaver was once overridden by glacier ice. The scarred rock left behind following glacial erosion can indicate the direction of ice flow and can give clues to help understand subglacial conditions and forces. Geomorphological features found on the Cleaver include chatter marks, striations and roche moutonnee (all of which are defined below). Leah Nelson’s project is the creation of a geomorphological walking tour on the Camp 18 nunatak that identifies these features for future generations of JIRP students. The following photos and definitions are part of this project. Chattermarks: Chattermarks are a series of small and closely spaced crescent-shaped features made by vibratory chipping of the bedrock surface by rock fragments carried in ice at the base of the glacier. Their shape indicates movement; they are generally convex in the direction of ice motion. The bedrock of the Cleaver is littered with chattermarks, showing the movement of the overriding ice. 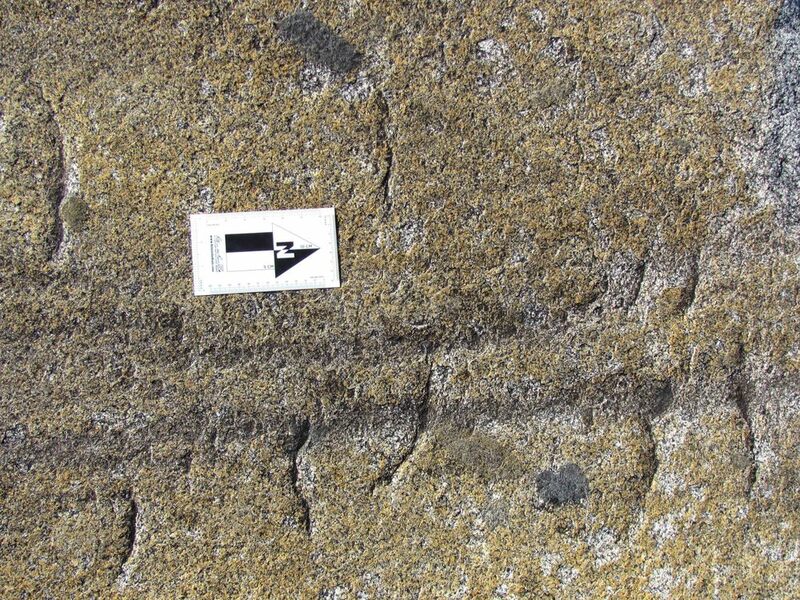 Striations: Striations are multiple scratches, often parallel, inscribed on the bedrock surface. These are caused by the sediment load in the base of the glacier that scraped along the bedrock. In some places on the Cleaver, you can see striations that pass through both the bedrock and inclusions that are of a different rock type. This instance of differential weathering shows the contrasting resistances between the two types of rock due to their composition. Striations through a xenolith. Photo by Leah Nelson. Roche Moutonnee: A roche mountonnee is an elongated bedrock knob whose long axis is oriented in the direction of ice movement. The upstream side is gently inclined, smoothly rounded and striated; while the downstream side is rough and steep, often with portions of rock removed or plucked away during formation. The term comes from the French and means “sheep-backed rock”. Author Leah Nelson gives scale to a roche mountonnee on the Cleaver. Photo by Patrick Englehardt. Author Patrick Englehardt stands on another roche mountonnee with the impressive Gilkey Trench in the background. Photo by Leah Nelson.